These highlights do not include all the information needed to use FROVA® safely and effectively. See full prescribing information for FROVA®. FROVA is indicated for the acute treatment of migraine with or without aura in adults. Use only if a clear diagnosis of migraine has been established. If a patient has no response for the first migraine attack treated with FROVA, reconsider the diagnosis of migraine before FROVA is administered to treat any subsequent attacks. FROVA is not indicated for the prevention of migraine attacks. Safety and effectiveness of FROVA have not been established for cluster headache. If the migraine recurs after initial relief, a second tablet may be taken, providing there is an interval of at least 2 hours between doses. 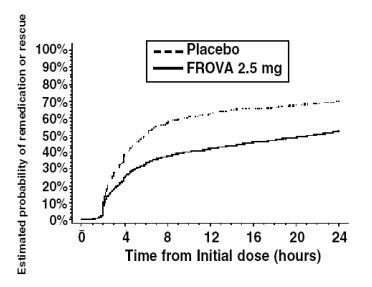 The total daily dose of FROVA should not exceed 3 tablets (3 x 2.5 mg per 24 hour period). There is no evidence that a second dose of FROVA is effective in patients who do not respond to a first dose of the drug for the same headache. 2.5 mg Tablets: Round, white, film-coated tablets debossed with 2.5 on one side and "E" on the other side. Recent use (i.e., within 24 hours) of another 5-HT1 agonist, an ergotamine containing or ergot-type medication such as dihydroergotamine (DHE) or methysergide [see Drug Interactions (7.1, 7.2)]. FROVA is contraindicated in patients with ischemic or vasospastic CAD. There have been rare reports of serious cardiac adverse reactions, including acute myocardial infarction, occurring within a few hours following administration of FROVA. Some of these reactions occurred in patients without known CAD. FROVA may cause coronary artery vasospasm (Prinzmetal’s angina), even in patients without a history of CAD. Perform a cardiovascular evaluation in triptan-naïve patients who have multiple cardiovascular risk factors (e.g., increased age, diabetes, hypertension, smoking, obesity, strong family history of CAD) prior to receiving FROVA. Do not administer FROVA if there is evidence of CAD or coronary artery vasospasm [see Contraindications (4)]. For patients with multiple cardiovascular risk factors who have a negative cardiovascular evaluation, consider administrating the first FROVA dose in a medically-supervised setting and performing an electrocardiogram (ECG) immediately following FROVA administration. For such patients, consider periodic cardiovascular evaluation in intermittent long-term users of FROVA. Life-threatening disturbances of cardiac rhythm including ventricular tachycardia and ventricular fibrillation leading to death have been reported within a few hours following the administration of 5-HT1 agonists. Discontinue FROVA if these disturbances occur. FROVA is contraindicated in patients with Wolff-Parkinson-White syndrome or arrhythmias associated with other cardiac accessory conduction pathway disorders [see Contraindications (4)]. Sensations of pain, tightness, pressure, and heaviness have been reported in the chest, throat, neck, and jaw after treatment with FROVA and are usually non-cardiac in origin. However, perform a cardiac evaluation if these patients are at high cardiac risk. The use of FROVA is contraindicated in patients with CAD and those with Prinzmetal’s angina [see Contraindications (4)]. Before treating headaches in patients not previously diagnosed as migraineurs, and in migraineurs who present with symptoms atypical of migraine, other potentially serious neurological conditions need to be excluded. FROVA is contraindicated in patients with a history of stroke or TIA [see Contraindications (4)]. FROVA may cause non-coronary vasospastic reactions, such as peripheral vascular ischemia, gastrointestinal vascular ischemia and infarction (presenting with abdominal pain and bloody diarrhea), splenic infarction, and Raynaud’s syndrome. In patients who experience symptoms or signs suggestive of a vasospastic reaction following the use of any 5-HT1 agonist, rule out a vasospastic reaction before using FROVA [see Contraindications (4)]. Serotonin syndrome may occur with FROVA, particularly during co-administration with selective serotonin reuptake inhibitors (SSRIs), serotonin norepinephrine reuptake inhibitors (SNRIs), tricyclic antidepressants (TCAs), and monoamine oxidase (MAO) inhibitors [see Drug Interactions (7.3)]. Serotonin syndrome symptoms may include mental status changes (e.g., agitation, hallucinations, coma), autonomic instability (e.g., tachycardia, labile blood pressure, hyperthermia), neuromuscular aberrations (e.g., hyperreflexia, incoordination), and/or gastrointestinal symptoms (e.g., nausea, vomiting, diarrhea). The onset of symptoms usually occurs within minutes to hours of receiving a new or a greater dose of a serotonergic medication. Discontinue FROVA if serotonin syndrome is suspected. Significant elevation in blood pressure, including hypertensive crisis with acute impairment of organ systems, has been reported on rare occasions in patients treated with 5-HT1 agonists, including patients without a history of hypertension. Monitor blood pressure in patients treated with FROVA. FROVA is contraindicated in patients with uncontrolled hypertension [see Contraindications (4)]. There have been reports of reactions, including anaphylaxis and angioedema, in patients receiving FROVA. Such reactions can be life threatening or fatal. In general, anaphylactic reactions to drugs are more likely to occur in individuals with a history of sensitivity to multiple allergens. FROVA is contraindicated in patients with a history of hypersensitivity reaction to FROVA [see Contraindications (4)]. FROVA was evaluated in four randomized, double-blind, placebo-controlled, short-term trials. These trials involved 2392 patients (1554 on FROVA 2.5 mg and 838 on placebo). In these short-term trials, patients were predominately female (88%) and Caucasian (94%) with a mean age of 42 years (range 18 to 69).The treatment-emergent adverse events that occurred most frequently following administration of FROVA 2.5 mg (i.e., in at least 2% of patients), and at an incidence ≥1% greater than with placebo, were dizziness, paresthesia, headache, dry mouth, fatigue, flushing, hot or cold sensation, dyspepsia, skeletal pain, and chest pain. In a long-term, open-label study where 496 patients were allowed to treat multiple migraine attacks with FROVA 2.5 mg for up to 1 year, 5% of patients (n=26) discontinued due to treatment-emergent adverse events. Table 1 lists treatment-emergent adverse events reported within 48 hours of drug administration that occurred with FROVA 2.5 mg at an incidence of ≥2% and more often than on placebo, in the four placebo-controlled trials. The events cited reflect experience gained under closely monitored conditions of clinical trials in a highly selected patient population. In actual clinical practice or in other clinical trials, these incidence estimates may not apply, as the conditions of use, reporting behavior, and the kinds of patients treated may differ. The following adverse reactions were identified during post approval use of FROVA. Because these events are reported voluntarily from a population of uncertain size, it is not always possible to reliably estimate their frequency or establish a causal relationship to drug exposure. Ergot-containing drugs have been reported to cause prolonged vasospastic reactions. Because these effects may be additive, use of ergotamine-containing or ergot-type medications (like dihydroergotamine or methysergide) and FROVA within 24 hours of each other is contraindicated [see Contraindications (4)]. Because their vasospastic effects may be additive, co-administration of FROVA and other 5-HT1 agonists (e.g., triptans) within 24 hours of each other is contraindicated [see Contraindications (4)]. There are no adequate data on the developmental risk associated with the use of FROVA in pregnant women. In animal studies, frovatriptan produced developmental toxicity (embryofetal lethality, fetal abnormalities, and decreased embryofetal growth) when administered to pregnant rats and rabbits at doses greater than those used clinically [see Animal Data]. When pregnant rats were administered frovatriptan (oral doses of 0, 100, 500, or 1000 mg/kg/day) throughout organogenesis, increased embryofetal mortality and an increased incidence of fetal malformations were observed at the high dose; decreased fetal body weights and increased incidences of fetal structural variations associated with growth impairment were observed at all doses. The lowest effect dose for embryofetal developmental toxicity in rats (100 mg/kg/day) is approximately 130 times the maximum recommended human dose (MRHD) of 7.5 mg/day on a body surface area (mg/m2) basis. The developmental and health benefits of breastfeeding should be considered along with the mother’s clinical need for FROVA and any potential adverse effects on the breastfed infant from frovatriptan or from the underlying maternal condition. The safety and effectiveness in pediatric patients have not been established. Therefore, FROVA is not recommended for use in patients under 18 years of age. There are no additional adverse reactions identified in pediatric patients based on postmarketing experience that were not previously identified in adults. No dosage adjustment is necessary when FROVA is given to patients with mild to moderate hepatic impairment. There is no clinical or pharmacokinetic experience with FROVA in patients with severe hepatic impairment. Because a greater than two-fold increase in AUC is predicted in patients with severe hepatic impairment, there is a greater potential for adverse events in these patients, and FROVA should therefore be used with caution in that population. The empirical formula is C14H17N3O.C4H6O4.H2O, representing a molecular weight of 379.4. Frovatriptan succinate is a white to off-white powder that is soluble in water. Each FROVA tablet for oral administration contains 3.91 mg frovatriptan succinate, equivalent to 2.5 mg of frovatriptan base. Each tablet also contains the inactive ingredients lactose NF, microcrystalline cellulose NF, colloidal silicon dioxide NF, sodium starch glycolate NF, magnesium stearate NF, hypromellose USP, polyethylene glycol 3000 USP, triacetin USP, and titanium dioxide USP. Frovatriptan binds with high affinity to 5-HT1B/1D receptors. The therapeutic activity of FROVA is thought to be due to the agonist effects at the 5-HT1B/1D receptors on intracranial blood vessels (including the arterio-venous anastomoses) and sensory nerves of the trigeminal system which result in cranial vessel constriction and inhibition of pro-inflammatory neuropeptide release. Binding of frovatriptan to serum proteins is low (approximately 15%). Reversible binding to blood cells at equilibrium is approximately 60%, resulting in a blood: plasma ratio of about 2:1 in both males and females. The mean steady state volume of distribution of frovatriptan following intravenous administration of 0.8 mg is 4.2 L/kg in males and 3.0 L/kg in females. The AUC of frovatriptan in patients with mild (Child-Pugh 5-6) to moderate (Child-Pugh 7-9) hepatic impairment was about twice that of young, healthy subjects, but within the range observed in healthy elderly subjects and was considerably lower than the values attained with higher doses of frovatriptan (up to 40 mg), which were not associated with any serious adverse effects. There is no clinical or pharmacokinetic experience with FROVA in patients with severe hepatic impairment. The pharmacokinetics of frovatriptan following a single oral dose of 2.5 mg was not different in patients with renal impairment (5 males and 6 females, creatinine clearance 16 - 73 mL/min) compared to subjects with normal renal function. Frovatriptan is not an inhibitor of human monoamine oxidase (MAO) enzymes or cytochrome P450 (isozymes 1A2, 2C9, 2C19, 2D6, 2E1, 3A4) in vitro at concentrations up to 250- to 500- fold higher than the highest blood concentrations observed in man at a dose of 2.5 mg. No induction of drug metabolizing enzymes was observed following multiple dosing of frovatriptan to rats or on addition to human hepatocytes in vitro. Although no clinical trials have been performed, it is unlikely that frovatriptan will affect the metabolism of co-administered drugs metabolized by these mechanisms. Male and female rats were dosed orally with frovatriptan prior to and during mating and in females up to implantation, at doses of 100, 500, and 1000 mg/kg/day (equivalent to approximately 130, 650, and 1300 times the MRHD on a mg/m2 basis). At all dose levels, there was an increase in the number of females that mated on the first day of pairing compared to control animals. This occurred in conjunction with a prolongation of the estrous cycle. In addition, females had a decreased mean number of corpora lutea, and consequently a lower number of live fetuses per litter, which suggested a partial impairment of ovulation. There were no other fertility-related effects. The efficacy of FROVA in the acute treatment of migraine headaches was demonstrated in four randomized, double-blind, placebo-controlled, short-term outpatient trials. In these trials, patients received doses of frovatriptan from 0.5 mg to 40 mg. In these controlled short-term trials, patients were predominately female (88%) and Caucasian (94%) with a mean age of 42 years (range 18 to 69). Patients were instructed to treat a moderate to severe headache. Headache response, defined as a reduction in headache severity from moderate or severe pain to mild or no pain, was assessed for up to 24 hours after dosing. The associated symptoms nausea, vomiting, photophobia, and phonophobia were also assessed. Maintenance of response was assessed for up to 24 hours post dose. In two of the trials a second dose of FROVA was provided after the initial treatment, to treat recurrence of the headache within 24 hours. Other medication, excluding other 5-HT1 agonists and ergotamine containing compounds, was permitted from 2 hours after the first dose of FROVA. The frequency and time to use of additional medications were also recorded. 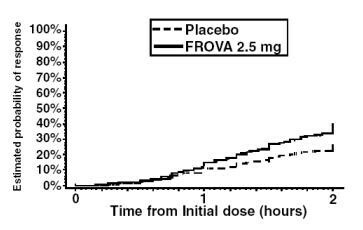 In all four placebo-controlled trials, the percentage of patients achieving a headache response 2 hours after treatment was significantly greater for those taking FROVA 2.5 mg compared to those taking placebo (Table 2). aITT observed data, excludes patients who had missing data or were asleep. Figure 1 shows a Kaplan-Meier plot of the probability over time of obtaining headache response (no or mild pain) following treatment with FROVA 2.5 mg or placebo. The probabilities displayed are based on pooled data from the four placebo-controlled trials described in Table 2. Patients who did not achieve a response were censored at 24 hours. In patients with migraine-associated nausea, photophobia, and phonophobia at baseline there was a decreased incidence of these symptoms in FROVA treated patients compared to placebo. Store FROVA tablets at controlled room temperature, 25ºC (77ºF) excursions permitted to 15ºC to 30ºC (59ºF to 86ºF) [see USP Controlled Room Temperature]. Protect from moisture. Advise the patient to read the FDA approved patient labeling (Patient Information). Inform patients that FROVA may cause serious cardiovascular adverse reactions such as myocardial infarction or stroke, which may result in hospitalization and even death. Although serious cardiovascular reactions can occur without warning symptoms, instruct patients to be alert for the signs and symptoms of chest pain, shortness of breath, weakness, slurring of speech, and instruct them to ask for medical advice when observing any indicative sign or symptoms. Instruct patients to seek medical advice if they have symptoms of other vasospastic reactions [see Warnings and Precautions (5.1, 5.2, 5.4, 5.5, and 5.8)]. Inform patients that anaphylactic reactions have occurred in patients receiving FROVA. Inform patients that such reactions can be life threatening or fatal and to seek immediate medical attention if they have anaphylactic symptoms. In general, anaphylactic reactions to drugs are more likely to occur in individuals with a history of sensitivity to multiple allergens [see Contraindications (4)]. Inform patients about the risk of serotonin syndrome with the use of FROVA or other triptans, particularly during combined use with SSRIs, SNRIs, TCAs, and MAO inhibitors [see Warnings and Precautions (5.7) and Drug Interactions (7.3)]. What is the most important information I should know about FROVA? an allergy to frovatriptan or any of the ingredients in FROVA. See the end of this leaflet for a complete list of ingredients in FROVA. are pregnant or plan to become pregnant. It is not known if FROVA can harm your unborn baby. are breastfeeding or plan to breastfeed. It is not known if FROVA passes into your breast milk. Talk to your doctor about the best way to feed your baby if you take FROVA. FROVA and certain other medicines can affect each other, causing serious side effects. Certain people should take their first dose of FROVA in their doctor’s office or in another medical setting. Ask your doctor if you should take your first dose in a medical setting. Take FROVA exactly as your doctor tells you. Take FROVA by mouth with fluids. If you do not get any relief from your headache after your first FROVA tablet, do not take a second tablet without first talking with your doctor. If your headache comes back or you only get some relief from your headache, you may take a second FROVA tablet if it has been at least 2 hours after the first tablet. Do not take more than 3 FROVA tablets in a 24-hour period. It is not known if it is safe to take FROVA for more than 4 headaches in 30 days. If you take too much FROVA, call your doctor or go to the nearest hospital emergency room right away. You should write down when you have headaches and when you take FROVA so you can talk with your doctor about how FROVA is working for you. FROVA can cause serious side effects. Medication overuse headache. Some people who use too many FROVA tablets may have worse headaches (medication overuse headache). If your headaches get worse, your doctor may decide to stop your treatment with FROVA. These are not all the possible side effects of FROVA. For more information, ask your doctor or pharmacist. Call your doctor for medical advice about side effects. You may report side effects to FDA at 1-800-FDA-1088. Store FROVA between 68°F to 77°F (20°C to 25°C). General information about the safe and effective use of FROVA. Medicines are sometimes prescribed for purposes other than those listed in a Patient Information leaflet. Do not use FROVA for a condition for which it was not prescribed. Do not give FROVA to other people, even if they have the same symptoms that you have. It may harm them. You can ask your doctor or pharmacist for information about FROVA that is written for health professionals. For more information, go to www.FROVA.com or call 1-800-462-3636.